I would like to personally welcome all our members, those who have come from SteadyOptions, Seeking Alpha, and those which have come from elsewhere. I would encourage everyone to read the Anchor Frequently Asked Questions and the Anchor Trade Strategy topics. Those two topics should provide answers to the majority of your questions, as well a detailed discussion on what the Anchor Strategy is all about. You can see the Anchor Trades performance here. So What is an Anchor Trade? To put it simply, an Anchor Trade should be one that forms the keystone of any investment portfolio -- that reliable corner that you know you can depend on, regardless of market conditions. The one that lets you sleep at night, knowing your money is at work, but not subject to large risks. An Anchor trade's goal is to prevent loss of capital while still generating a positive net return in all market conditions. This strategy began with the premise that it must be possible to virtually fully hedge against market losses, without sacrificing all upside potential. Anchor trades are concerned for full year, full portfolio, protection, regardless of market conditions. Many investors try to insure against losses after those losses have already been incurred, or as they are occurring in real time – this is a mistake. It’s easy to be an investor during a prolong bull market, but what happens when a severe, or even mild, market correction occurs? At that point many investors find themselves trapped in falling positions, have stop losses kicking in, and are at a loss as what to do – other than to watch their principle dissipate. In the modern era of flash crashes, swift market volatility changes, and world risk it simply makes no sense to be invested in anything without portfolio protection. It is impossible to routinely predict the next negative major market event, therefore 365 days of protection is a necessity. I have given up trying to predict the day to day movements of the market -- therefore I Anchor my portfolio with this strategy (which can easily then be paired with other strategies). In the current market environment, such precautions are particularly warranted. It is my opinion that much of the recent market gains have been artificially propped up by low interest rates, the Federal Reserve, and the lack of alternative investment choices which can provide income to investors. At some point in the future the market is due, at the very least, for a correction, if not a significant down turn. With increasing turmoil in Syria, North Korea, and elsewhere in the Middle East, who knows what could tip the markets. Will this occur within two weeks, six months, one year, or even longer is something I've given up trying to predict. Rather I seek to protect against such events – whenever they may occur. Some strategies try to partially hedge against market risk through long short strategies, through the straight purchase of puts (typically out of the money at a substantial cost to the portfolio), through default swaps, or through numerous other instruments. However, each of these strategies only offers partial portfolio protection which either comes at a cost or which just assumes a set loss in the portfolio (such as ten or fifteen percent) is acceptable. I refuse to accept that philosophy and have developed a strategy around annual portfolio protection. Defining The Anchor Strategy describes the profits targets for the Anchor strategy. The impact of not experiencing losses in down market years, while only slightly lagging (if lagging at all) in positive and neutral years, is astronomical over any extended period of time. Utilizing the Anchor strategy over a number of years, particularly if any of those years are bear markets, should lead to the strategy significantly outperforming the markets as a whole, as back-testing has demonstrated. Even in prolonged bull markets, the returns should still be positive and lag negligibly behind. The peace of mind which comes with being fully hedged more than compensates for the potential of slightly underperforming the market as a whole in prolonged bull scenarios. Special thanks to Reel Ken, Kim Klaiman, and others who helped me evolve this strategy to its current form through their articles and discussions. The Anchor strategy's s primary objective is to have positive returns in all market conditions on an annual basis. Well how in the world does it do that? 1. The Anchor Trades forum will post my actual trades from my individual account, including weekly rolls, and any adjustments I make, as well as the price I received when filled. It will also include a thread for "model" trades that will be launched monthly. Model trades will be for those members who join after the initial actual trades are established, so any member can set up their own Anchor Portfolio. This way any member, regardless of when they join, will have a thread to follow applicable from their initial membership date. If you want to get notifications about the trades, you should follow this forum (by clicking "Follow this forum" button). If you follow this forum, you will receive an email when a new topic (trade) is posted. 2. The Anchor Trades Discussions forum will discuss each trade that has been made, detail the calculations behind the decision, and provide a Q&A forum for members to ask about any one trade. The thread will also have columns about the theory behind the Anchor strategy, implementation discussions, and be open to members to ask general questions. If you have any questions about the threads, where information can be found, or just general questions, please feel free to send a message to either Kim or myself. I look forward to helping all member learn about this strategy and hopefully implement it themselves. As we can see, the strategy achieved its official goals in all years except for 2011. The strategy did lag the S&P by 2.5% in 2011, but outperformed by 2-4% in 2010 and 2013. In fact, when you remove 2008 and calculate the non-compounded return, you get 82.12% for the strategy vs. 82.77% for the S&P. 2008 performance was exactly as expected, and this made the whole difference. In the event of very large crashes, we can actually make money. In larger bull markets, the Leveraged Anchor outperforms both Traditional Anchor and simply being long stock as there is actual leverage being used. Some of this will depend on just how fast the market is rising and how often the long hedge is rolled, but in large bull markets, it should still regularly outperform. In fact, in any one period where the market grows more than 3.5% to 4.0%, the Leveraged Anchor will outperform simply being long SPY. The Leveraged version of Anchor will always outperform Traditional Anchor in any up markets. 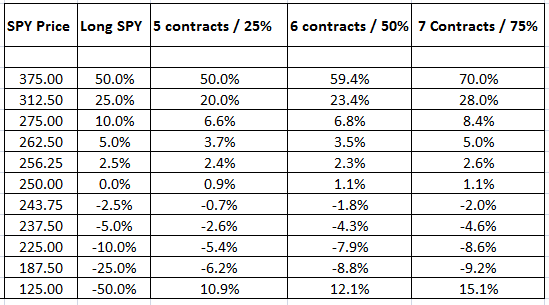 Above is a table showing the performance of SPY, then using 25% leverage, 50%, and 75% leverage after certain market moves over a thirty day period. After reviewing the above, and similar tables over longer periods of time, we made a decision that utilizing 50% leverage was optimal. You of course can adjust, taking on more leverage, or less, as you see fit. Note the above table does not include any gains from BIL dividends. That should add around 10 to 20 basis points more performance per month on the leveraged versions.